Once, neighborhood bakeries were almost as common in The Lou as banks. Practically every ethnic group had its own – Polish, Russian, Swiss, Bohemian, Syrian and Italian among them. There were kosher bakeries and French pastry shops; distinctive but certainly not exclusive to their own nationalities, for St. Louisans sampled and patronized great bakeries wherever they found them. This was a big improvement over Colonial times when St. Louis earned the nickname, Pain Court (Short of Bread). As early as 1770, Jeanette Forchet, a free woman of color was supporting four children as a laundress after the death of her husband, Gregoire, and legend has it gaining a reputation for baking the best bread in the Village of Saint Louis. By the late 19th and early 20th centuries German bakeries were the most numerous in St. Louis, catering to the city’s largest immigrant group. But their flaky, fruit-filled strudels, candied stollens, streussel coffee cakes, Springerle cookies and savory rye breads became favorites of the many other immigrant groups that contributed to St. Louis being designated the fourth city in the nation in commerce and population, by the U.S. Census of 1890. By the 1960s most of these neighborhood bakeries had disappeared but a fair number survived. Today there are more ethnic bakeries on The Hill, where Italian breads reign supreme, than in any other St. Louis neighborhood. Locals may argue over the best but know that it’s wise as well as convenient to choose the bakery according to what you’re serving on a given night – Marconi’s, Amighetti’s, Vitale’s or the Missouri Baking Company. On October 19, 1987 entrepreneur turned baker, Ken Rosenthal, opened the St. Louis Bread Company in Kirkwood, a community in St. Louis County. His concept was so sensational that it took The Lou and eventually the nation by storm: a combination bakery-cafe featuring delicious coffees, soups, sandwiches, salads – and most importantly, breads and pastries baked fresh every day – in a relaxed and warm setting where friends, neighbors and business associates could gather. Wi-fi access would become an added draw. His inspiration came during a trip to San Francisco where he visited some excellent coffee houses and bakeries and sampled sourdough bread, with which Rosenthal fell in love. He brought a sourdough starter back to St. Louis and built his bakery-cafe around it. His was an experiment in the return of the small, St. Louis neighborhood bakery with a San Francisco twist. A neighborhood bakery it turns out that could work in almost any neighborhood in the country. I’m told that Ken Rosenthal’s St. Louis ancestors flourished in the garment trade. His talents would emerge as baker and restaurateur. “Creating sourdough is a slow, tedious process,” Rosenthal told KSDK-TV reporter, Jennifer Blome in a 1988 interview filmed on site at his flagship bakery/cafe. (http://www.youtube.com/watch?v=vRAkQ2bamgg). But beginning the day’s baking at 2:00 am is something he found that he enjoyed. Ken Rosenthal has since moved to Colorado to be near his children and grandchildren but he remains Panera Bread’s largest franchisee. His local model is a proven recipe for success. Today there are twenty-six locations in the Greater St. Louis area and 1,562 Panera Bakery Cafes (several under the previous name of Paradise Bakery and Cafe) in forty of the 49 continental United States and Ontario, Canada. In 2012, respondents to a Harris Poll voted Panera – Best Casual Dining Brand in the U.S. It also consistently ranks as one of the healthiest. Known elsewhere as Panera Bread and locally as The St. Louis Bread Company, Rosenthal’s initial investment of $150,000 supplemented by a SNA loan of an additional $150,000 blossomed into the $14,000,000 for which he sold the company in 1993. The buyer? Ronald Shaich, owner of Au Bon Pain (an earlier, very successful chain of bakery-cafes) who changed the name to Panera. Shaich serves currently as Panera’s Chairman of the Board and CO-CEO along with William Moreton, Panera Bread’s President. By 2010 Panera Bread was a 1.3 billion dollar enterprise. As I wandered into the Bread Co. downtown for lunch a few weeks back I watched a baker carry out a large tray of assorted cupcakes. After establishing a reputation for numerous delicious pastries, coffee cakes and bagels, the St. Louis Bread Company had now entered the cupcake wars. Brian Rubach, a District Manager of Panera in St. Louis, explained to me that “not all, but a lot of tests for the whole company, are still done here” in St. Louis, which remains the center of (the company’s) operation.” You can only find the cupcakes in select St. Louis cafes where they are being test-marketed. A very recent experiment, time will tell whether or not they become a Panera staple like Broccoli Cheddar Soup in a Sourdough Bread Bowl, Pumpkin Muffies or the Bread Co.’s killer Frozen Mochas. The cupcakes are rich, moist and decadent. Whatever experiments follow, customers can count on ingredients being fresh and of the highest quality, service being friendly, and the franchises community-centered. Baked goods remaining at closing each day are distributed to local charities. Contributions dropped in the “Share the Bread” boxes on the counter of every St. Louis Bread Company are donated to Operation Food Search to support local food pantries. Panera is a company characterized by generosity as well as taste. Believe it or not the sign pictured at right is one of the most frequently photographed in downtown St. Louis. It’s not unusual to hear out-of-towners comment as they stand in line deciding upon what to order, what a “knockoff” the cafe at 6th & Pine is of Panera. When they learn that it is Panera with a local title, Brian Rubach told me, they pose for pictures at the sign outside the front door. The Lou still boasts some wonderful bakeries of long-standing, such as those already mentioned on The Hill, as well as Carondelet, Pratzel’s, Federhoffer’s, McArthur’s, La Bonne Bouchee. And while Polish and Hungarian bakeries have given way to Mexican and Bosnian pastry shops, excellent, artisan bakeries like Surgaree, Sweet Arts and Pint-Size are wowing St. Louisans anew. But when it comes to national name-recognition we have only one, signature, neighborhood bakery-cafe. At home it bears this city’s name. But elsewhere they call it Panera! References: * Boudin Bakery website: (http://boudinbakery.com/), ** Brian Rubach, Panera Bread District Manager; wikipedia.com; Panera Bread website: (http://www.panerabread.com/). 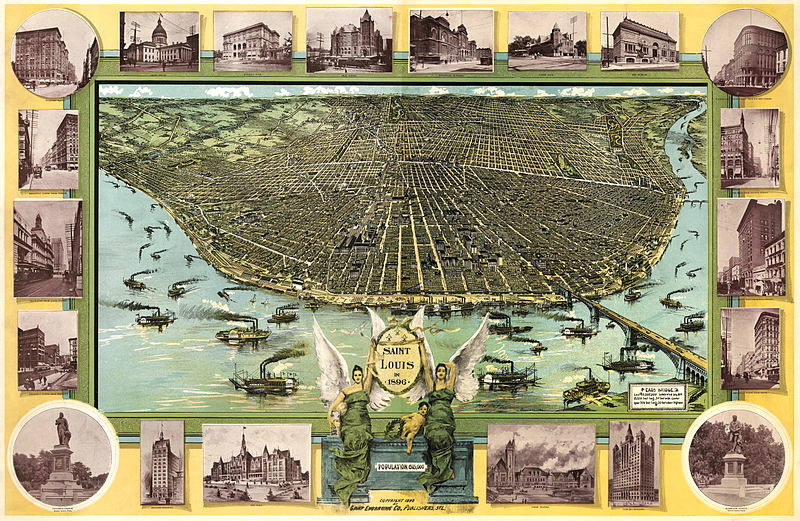 Illustration Credits: St. Louis Birdseye Map, 1896 – by Fred Graf – in the U.S. Public Domain at wikipedia.org., Deutsche:Frau biem Brotbacken – by Jean-Francois Millet, 1854 – in the public domain at wikimediacommons.org. Photo Credits: Masa madre.jpg – in the public domain at wikimediacommons.org; Bread in Boudin – Fisherman’s Wharf – author: Edward Z. Yang, Creative Commons Share Alike 2.5 at wikimediacommons.org. ; Photos captured with my cell phone of the St. Louis Bread Company at 6th & Pine and at St. Louis Hills – Maureen O’Connor Kavanaugh, author of this blog. Special thanks to Brian Rubach, St. Louis District Manager of Panera Bread, for taking a few minutes out of his busy schedule for an interview! This entry was posted in Colonial St. Louis, Commentary and Criticism, Happenings, Neighborhoods, St. Louis and tagged Au Bon Pain, Colonial St. Louis, Jeanette Forchet, Ken Rosenthal, Pain Court, Panera Bread, Pint Size Bakery, Ronald Shaich, Sourdough Bread, St. Louis Bread Company. Bookmark the permalink. 2 Responses to The Lou’s Signature Bread Co. Awesome tribute, Maureen. Bread is so basic and so inviting to all. It binds us together and creates community. Thanks for this wonderful attention to a St. Louis institution established by someone from our generation. Gracias, Querida Amiga! I’m so honored that you like it, Holly! And I am sooooo grateful to Ken Rosenthal for the St. Louis Bread Company!